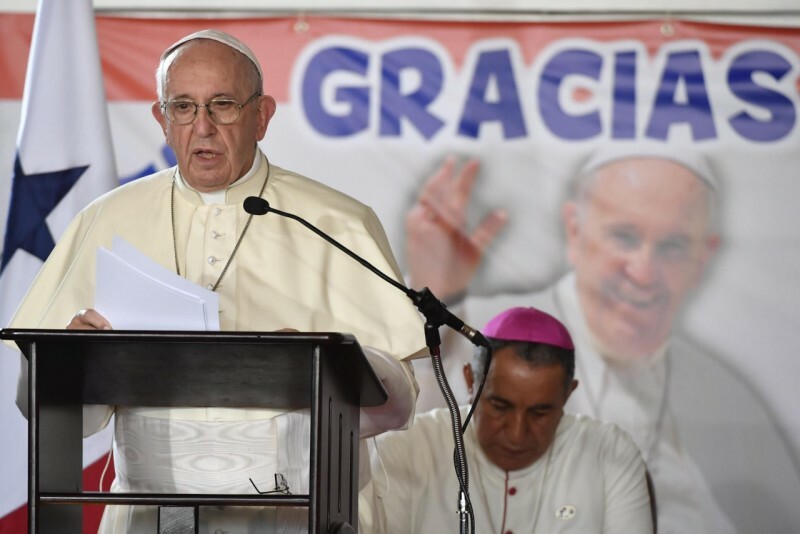 The Holy Father on January 27, 2019, commented on several tragedies in his remarks following the praying of the Angelus at the Good Samaritan Home, a stop on his trip to Panama during World Youth Day. Following are his remarks, released by the Vatican Press Office. Being held today is the International Day of Commemoration in Memory of the Victims of the Holocaust. We need to keep alive the memory of the past tragedies and to learn from the black pages of history, to never again commit the same errors. Let us continue to make an effort, without pause, to cultivate justice, to foment concord and to support integration to be instruments of peace and builders of a better world. I wish to express my sentiment of sorrow for the tragedies that have struck the State of Minas Gerais in Brazil and the State of Hidalgo in Mexico. I entrust all the deceased persons to God’s mercy and, at the same time, I pray for the wounded and express my affection and spiritual closeness to their families and to all the people. Here, in Panama, I have thought a lot about the Venezuelan people, to whom I feel particularly united in these days. In face of the grave situation they are going through, I ask the Lord that a just and peaceful solution be sought and achieved, respecting human rights and desiring exclusively the good of all the inhabitants of the country. I invite you to pray, putting this intention under the protection of Our Lady of Coromoto, Patroness of Venezuela. To Christ and to the Virgin we also entrust the victims of the terrorist attack perpetrated this Sunday in the Cathedral of Jolo in the Philippines, while the Eucharist was being celebrated. I reiterate my firm reprobation for this episode of violence, which puts this Christian community in mourning again and I elevate my prayers for the deceased and for the wounded. May the Lord, Prince of Peace, convert the heart of the violent and grant the inhabitants of that region a serene coexistence.